Bolivia, Ethiopia, Italy, Kazakhstan and Sweden will begin their two-year term as non-permanent members of the UN Security Council on Sunday, January 1. The countries are replacing Angola, Malaysia, New Zealand, Spain and Venezuela, whose mandate expired on December 31. On January 1, 2018, the Netherlands will replace Italy as a non-permanent member of the council on January 1, 2018, according to an agreement reached by Rome and Amsterdam after they both received 95 votes each following five rounds of voting in the General Assembly. 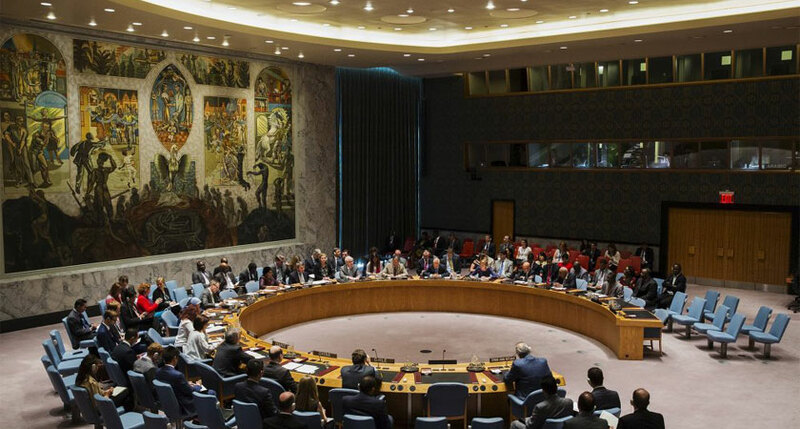 The UN Security Council consists of 15 states, namely five permanent (Russia, France, China, the United States and the United Kingdom) and 10 non-permanent members that are to be elected for two years. Egypt, Japan, Senegal, Ukraine and Uruguay will remain non-permanent members of the council, with their terms expiring on December 31, 2017. It will be interesting to watch how Egypt and Ethiopia play this one out …. Contrary to what you might hear on some media outlets, Ethiopia being a peace loving country will advance the cause for all peace loving countries in the horn as well as allies who stood with us even when it was difficult. It’s also a good opportunity for peace loving Eritreans to come up with a clear vision that would enable the people of Eritrea to live in peace with Djibouti, Yemen, Somalia as well as Ethiopia. It’s time to educate on what the future would look like in the absence of shabo, how lasting peace can be achieved and taking away the narrative standing up to abuse, slavery, lack of accountability doesn’t mean it’s being a sell out or “woyane” quite the opposite. Best of luck for my people and kudos to Dr. Adhanom and the team for working hard to put us on the map once again. When your pants are wet day dreaming becomes a second to lying!!! I pity your Dr Adhanom he did not manage to pass his interview but made you a non permanent UNSC, hmmm classic Tigrigna saying Mai N’aqeb time, thanks for being perfect Uncle Tom. Dr. Adhanom Gereanenya was exposed as an incompetent idiot who could not put two coherent sentences together or answer basic question about why he is interested in the job. it was a disastrous job interview if I ever saw one but it revealed his incompetency. IQ, don’t believe the hype my brother. The bad blood between Somali, Ethiopia has been buried. It’s that silly season, if you ask most except our cousins it’s marvelous, really. Ugumesh, the only similarity between Somali people and low IQ Woyane is they both leave the Woyane corpses in the streets of Somalia for local hyenas. U confusing peace with terror. Ur beloved Woyane-Tigray is terrorizing its neighbors for its own benefits. Egypt and Ethiopia are both us Allies. They’re both receiving huge chunk of money from the West.. They won’t interfere with each others business. Egypt will loose the battle. The only thing Egypt can do is slow the funding down.. Make sure that Ethiopia can’t progress with the GERD in time.. But they can’t stop it. You can’t expect two slaves to fight each other. They wouldn’t dare. Can Woyane with its western masters propose a UN Security Resolution to Refer Eritrea to the ICC, put simply whats to stop Woyane doing that under the command of western masters ? Ethiopia itself would be referred to the ICC before Eritrea. The mandate of COI has already expired. There is no appetite to refer Eritrea or any more African countries to the ICC, especially when you consider the shoddy work the COI did. The report is as biased as can be. Plus, Obama WH and Susan Rice and Samantha Powers and Hilary Clinton are gone. Incoming Trump Admin will not care. LOL I like your name, although I admire your sentiment I will only be comfortable if Eritrea is perm member of the UN Security Council then Russia and China wont be able to stab us in the back again like 1907 and 2023. They sure did and that tells you there is no such things as “friends” with out interest. Let me introduce you with an Amharic saying that goes “የተበላ ዕቁብ”. Project “Kneeling Down Eritrea” through Human Rights card has been defeated largely due to the exceedingly exaggerated and obviously one-sided, politically motivated, non-objective and completely out of reality report prepared by none other than the COI-E. It is now decided any Human Rights related issue on Eritrea will be reviewed by the UN High Commissioner for Human Rights Office [not the Security Council] and under the Universal Periodic Review (UPR) – exactly what we have been asking for. Therefore, Human Rights card is like የተበላ ዕቁብ. It doesn’t work anymore. The COI-E is now expired and closed its shop while the good-for-nothing Rapporteur got a one year window of opportunity to prove her relevance before her mandate expires. So the only way Sweden and Ethiopia with the help of France and UK create pressure on Eritrea is by waging the Sanction card. Ethiopia is in a better position now to lobby anything against Eritrea specially about lifting of the sanction. It definitely will try to make lifting of the sanction “conditional” to Eritrea’s assistance to anti-Ethiopia armed opposition groups. But that may not hold water given the fact that Ethiopia itself hosts a number of anti-Eritrea armed groups. When the Council convened on April 31, 2017 to deiced on Eritrea sanction (not for total lifting), it is expected of Ethiopia to use its lone vote card against and such conflict of interest will not be lost for council members any how. It’s hard to tell now since we hardly know what the upcoming US administration looks like, but my gut feeling tells me that, it won’t be worse than the Obama – Susan administration and so a partial lifting of the sanction is almost imminent, since the bloody British turn total lifting “conditional” to the visit of ESMG to Eritrea. Thanks TN. Do you expect Bolivia to play an advocacy role in favor of Eritrea as Venezuela did last time? What about Egypt’s role? Egypt and Eritrea are closer allies now than they were two years ago. Bolivia = Venezuela, so we can count on. I believe they are two different countries, but have similar outlook on global security and economic issues. Good to see Bolivia and Egypt still on UNSC along with Italy. Italy wants engagement with Eritrea. That is the only way to reduce immigration from Africa. Egypt is an ally of Eritrea. Bolivia is a socialist country like Venezuela and is very much sympathetic to Eritrea’s position. Sorry but Italian Gov is not a trusted partner. They are totally dependent on US for almost everything now days. They are the Woyane of Europe. It does not require a lot of research to see this. Try it. Ethiopia was also a member during the Dergue rule but that did not stop the regime’s demise. And now, given the real possibility of the end of wey~ane rule in 2017, and cosy relationship between Eritrea and the incoming Ethiopian government, it would not be far fetched to say Ethiopia will be an ally of Eritrea. You are correct, sir! Ethiopia was a member of UN Security Council in the late 1980s during Mengistu era. We know how things turned out for Mengistu. Weyane’s ultimate fate is not that different from Mengistu’s. Yep.. It’s same old same old tactics.. it didn’t even save the Derg regime. I can’t wait either to see how the 2 US poppets will behave at the world stage. It is so concerning that, the so called “UN Security Council”, mandate is to keep peace and security around the globe but surrounded by “never mind” I would not say it. May God Have Mercy on Ethiopia! Ethiopia will continue to disintegrate until it resolves its border issue with Eritrea. Indeed, soon it’s gonna happen. Whenever any draft resolution is ready on the floor for a vote, the battle is between the west and the east, that is those which are puppets to western countries side infavour of their masters while those with a communist or socialist style countries side with their allies, then fairness and justice will be lost in the middle of the process.the incoming non permanent members of the UNSC, egypt will definately fight for eritrean interest and ethiopia will try its best to exploit its membership to harm eritrea by all means be it fact or fiction specially to maintain the sanction regiom.bolivia and itally are expected to play fair role toward ethiopia and eritrea but the power of lobbying will affect circumstances.bolivia is some how a nuetral country and italy is happy to see eritrea its x-colony get relieved from its sanction,even if italy is ofcourse american friend, it has played many positive roles in pushing european union to engage eritrea and approve development aid.while sweden will surely side with ethiopia, kazakistan is also a friend of the US.but one thing we should note is that, ethiopian aggressive diplomatic policy may provide ample opportunity for countries to know the core issue of ethio-eritrea conflics and rivlary and this can expose ethiopia is running after its national interest but not working a fair game to bring peace and prosperity in the horn of africa region and arround the globe. Woyane has finally won a Jackpot, to directly beg for Quenty/Food Stamp, no need of NGOs. I just think it’s too much for the Dedebit illiterates. They will find a way to FUCQ it up. I think the Weyanit Quenty pickers Have to try this ” non-permanent member of the council ” before they vanish from Ethiopian Land. I don’t know how is going to work b?n Ethiopia and Egypt though.The USA and UK are trying to save Weyan what ever takes .For Eritrea it doesn’t make no different anyways .Eritrea case is not in the Weyany Hand .It is In God Hand.This obstacles is going to be piled out like a bad Anion lire one by one is going to be remove like Susan Rice and Mrs Clinton .Who Ever gambling with Eritrean land ,people and Government God will Put them down as always .